Depending on your Hajj or Umrah package, you’ll be flying into King Abdulaziz International Airport (KAIA) in Jeddah if you’re going to Makkah first or if you plan on an initial stay in Madinah, you’ll be landing at Prince Mohammad bin Abdulaziz Airport in Madinah. 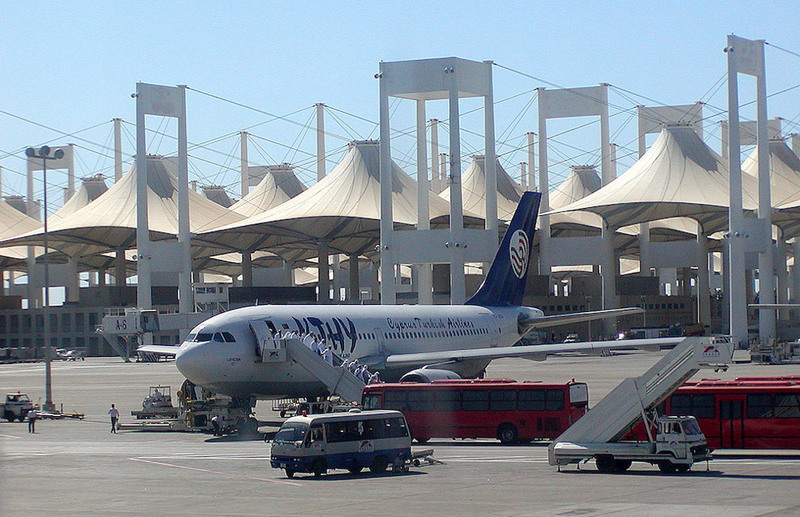 Since the majority of pilgrims land in Jeddah, we will be explaining the processes at this airport for the purpose of this article although the procedures for both airports are largely the same. 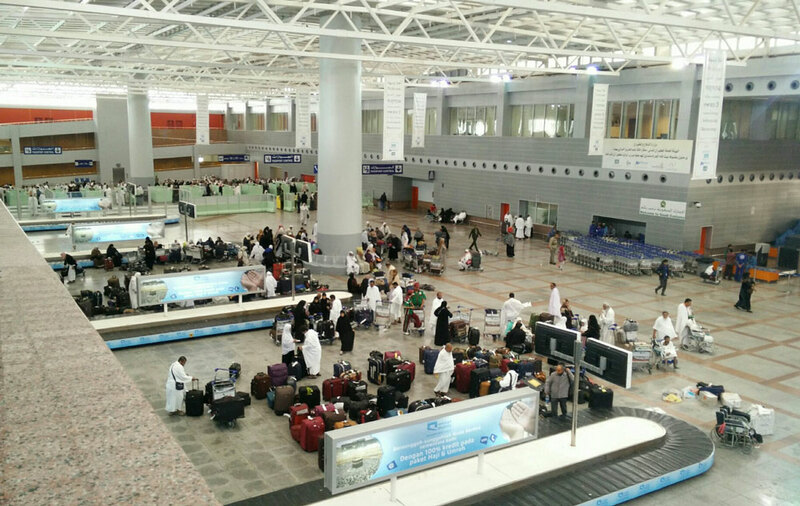 The airport in Madinah is smaller and generally less busy than its counterpart in Jeddah, so pilgrims are usually dealt with a lot quicker, especially those performing Umrah. Although Makkah is roughly just an hour away from the airport, you may not set foot in the blessed city for as long as 12 hours from the time you land in Jeddah. During this period, patience is a must. Little can be done to speed up the process. If you’re going to be performing Umrah outside of Hajj season, the procedures are slightly different and your stay at the airport should be significantly shorter. Please refer to the Umrah section at the end of this article so you know what to expect if you’re going for Umrah. All pilgrims, whether performing Hajj or Umrah, should be processed at the Hajj and Umrah Terminal. However, there have been occasions where pilgrims performing Umrah out of Hajj season have had to report to the North or South Terminal. If you’re going for Umrah and you’re unsure about which terminal to report to for your arrival and departure, ask your travel agent or get in touch with the airline you’re travelling with. The Hajj Terminal is estimated to be about five million square feet (465,000 m²), making it one of the largest airport terminals in the world. It is roofed by huge, white tent-like structures made from fibreglass. The lack of walls allows for natural ventilation and the roof provides shelter from the sun. It is estimated that 50,000 pilgrims can be accommodated for up to 18 hours during arrival and 80,000 pilgrims for up to 36 hours during departure. Before landing, make sure you have completed your arrival / disembarkation card, which should be provided to you by the cabin crew. If you’ve not received a card, request one. As you disembark the plane, ensure you don’t forget any clothing, footwear or other belongings. You will then board a shuttle bus on which you will travel to the Hajj Terminal. Upon arrival, you will be ushered into the waiting lounge where your passport and disembarkation card will be checked by staff from the United Agent’s office. A member of staff will remove an arrival barcode from your disembarkation card, apply it to your passport and return both items back to you. You may be in the waiting lounge for quite a while before you’re able to proceed so be prepared to wait. Use your time here to rest or do Dhikr. You will be separated into two groups according to your gender and will be processed on either side of the hall. If you’re a woman, make sure you have access to your passport, relevant documentation and a spare set of keys for your luggage beforehand. Queues can be very long in immigration and you’ll be on your feet for a fair amount of time before you’re seen by an official. This area is also where health checks may be carried out and vaccinations administered to pilgrims. You may get fingerprinted and photographed. Once you have completed the immigration process, you must look for your luggage which may not be on the conveyor belt as would normally be the case. At this point, make sure you stay close to your group as it easy to get lost or have luggage go missing. As there will be a lot of luggage in this area, ensure you mark your bags with something that makes them easily recognisable beforehand. Although luggage trolleys are available, they are few in number and usually taken as soon as they are brought in by airport staff. Make sure you don’t go out to collect a trolley as security won’t allow you back in. Once you’ve found your luggage, your bags will be checked by customs. Make sure all your bags are unlocked prior to arriving at the customs desk and prepare to have them unpacked and searched comprehensively. Ensure you don’t take any magazines or literature of a questionable nature (that the clerk may not understand) as well as any CDs and DVDs. These may be confiscated or cause considerable delays. If anything is confiscated, don’t argue or try to stop the clerk. If you have any medication, make sure it is clearly labelled to avoid any problems. Once the checks are completed, a sticker will be affixed to each bag by the customs official to indicate it has passed the customs check. After your luggage is in order, you will move out of the air-conditioned building into an open-walled area under huge tent-like structures where you will realise just how big the Hajj Terminal is. At this point, your luggage will be placed on a large trolley and taken away by a porter. Make sure you don’t lose sight of the trolley until your luggage is offloaded and have a member of your group place the luggage in a safe area where it does not get knocked over by people passing by. Keep in mind that the porters are paid to move your bags around so avoid giving them money, even if they insist. If they insist, avoid getting into an argument and ignore them. In this area, you will be subdivided into groups and assigned a Mutawwif (also referred to as a Muassasah) according to the nationality on your passport. A Mutawwif is a person appointed by the Ministry of Hajj (Saudi Arabian government) to primarily act as a guide for pilgrims and is responsible for the needs of pilgrims such as transportation, accommodation in Mina and Arafat etc. The Mutawwif is part of a Mutawwif office (Muassasah office) which oversees the well-being of pilgrims from your part of the world. These offices are also called “National Tawafa Establishment for Pilgrims of (country or region e.g. South Asia)”. The location of your camp in Mina, Arafat and Muzdalifah is dependent on which Mutawwif office you have been assigned to. Your Mutawwif will take your passport on arrival and return it to you when you depart. Provide a photo ID card in place of your passport. Ensure you don’t lose this card as you need to present it in order to exchange money and also to reclaim your passport prior to departing Makkah or Madinah. If you lose it, report it to the office as soon as possible. Inspect hotel accommodation to check if it’s up to the required standard for pilgrims. If the hotel is not up to standard, the owner of the hotel can be fined. Mediate in disputes between pilgrims and agents / hotels. Arrange funeral services and provide assistance with documentation in the event of a death. There are offices in Makkah, Madinah and Jeddah with members of staff who speak the respective languages of the countries they represent. It’s a good idea to acquaint yourself with the location of the office that represents your country. The hotel receptionist should be able to direct you to the relevant office in Makkah or Madinah. If the nationality in your passport is different to that of the country you reside in and the members of your group, you will need to alert the officials. Show them the visa in your passport which should have been issued by the Saudi embassy in the country you live in. This is usually enough to convince them to assign you to the same Mutawwif as other members of your group. This is especially important if members of your family have a different nationality to yours – you don’t want to be in a situation where you have been allocated camps at different ends of Mina, Arafat and Muzdalifah. Make sure you are in the queue for the counter allocated to pilgrims from your country (i.e. the country you’re a resident in). You don’t want to face the frustration of having to join another queue once you reach the counter as a result of having been in the wrong one. If you’re performing Hajj, a payment in the form of a banker’s draft / cheque is paid to the Mutawwif for the services they provide during Hajj. These drafts are normally factored into the price of your Hajj package and made on your behalf by your travel agent. This draft should be stapled to your passport and must be used to obtain your travel coupons, allowing you to travel within Saudi Arabia. At the counter, the officer will remove the stapled draft and affix a small booklet consisting of travel coupons to your passport. These coupons contain barcoded stickers which are removed by officials as your journey through Saudi Arabia progresses. If you do not use the travel coupons, for example, you arrange your own transport or you decide to walk during the five days of Hajj, you can claim a refund on these unused coupons upon departure at the Hajj Terminal. Before departing, seek out the Naqaba desk at the Hajj Terminal where you will need to produce your passport, fill out a form and sign it, in exchange for a voucher corresponding to the total value of the unused travel coupons. The voucher can then be exchanged for Riyals in a bank at the Hajj Terminal. 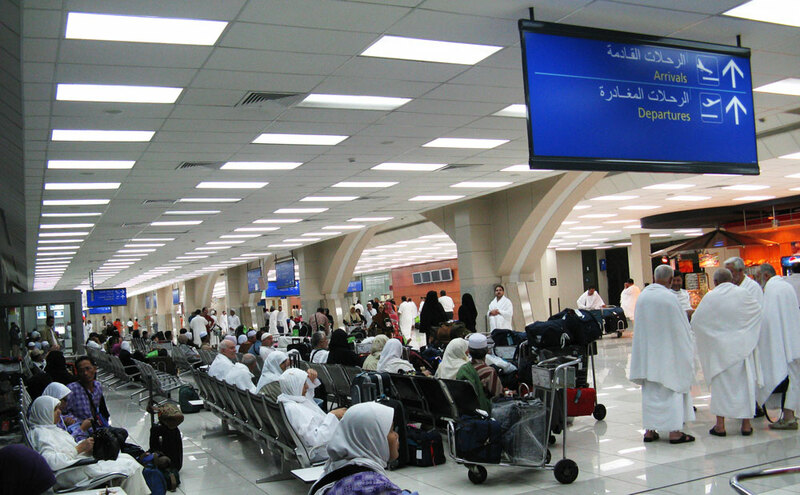 The procedures in the Hajj Terminal will take a fair amount of time so be prepared to wait. The terminal provides shops, toilets, showers, telephones, banking facilities as well as informational support services. There are also stalls belonging to various mobile phone companies from which you can purchase a Saudi sim card if you haven’t already been provided one by your travel agent. There are also designated areas where you can rest as well as prayer facilities. Whilst you’re in the Hajj Terminal, remain patient as you will most likely be waiting for a number of hours. You may also find that the facilities aren’t as good as those in other international airports and you’re likely to encounter staff that are unhelpful. As previously mentioned, the Hajj Terminal is huge and is easy to get lost in. Once you have settled down in a good spot, make a mental note of your exact location in relation to the colour of the walls (the walls are colour coded) and the sections of the terminal which are sorted alphabetically. If you don’t want to wait until you’re in Makkah or Madinah to exchange your cash at the money exchangers, you can have your money converted at a bank in the airport. When you exchange currency, ensure you obtain some smaller denominations (e.g. one and five Riyals), which will allow you to purchase smaller items such as snacks and drinks with ease. Shops tend to get very crowded, especially during Hajj season, and waiting for change can be a hassle. Keep in mind that there will be pickpockets and thieves who prey on pilgrims in Makkah and Madinah. To minimise the risk of your money being stolen, bring a good waist or neck pouch in which you can carry your money and other valuables. A pouch can be purchased in Makkah or Madinah if you haven’t bought one with you. Prior to leaving the terminal, you should take the opportunity to use the toilets and refresh your Wudhu if you need to as you may not encounter any facilities for a while. After the legal formalities have been completed and you have received your travel coupons, you will be escorted to government buses for your journey to Makkah or Madinah. As you reach the bus, you will have to hand your luggage over to staff in green overalls and board. As you get on, you will need to drop your passport into a bag held by the bus driver and then proceed to your seat. This is the last time you will see your passport until your departure from Saudi Arabia. Once you have boarded the bus, you won’t be allowed to disembark unless it is time for Salah. The bus won’t depart until its capacity has been filled and every seat is occupied, which is normally about 45 to 50 pilgrims. The Saudi officials will then perform passports checks and will only allow the bus to leave once the checks have been completed. This process can take a considerable amount of time. It is a good idea to keep some small snacks and a bottle of water with you while you’re on the bus. The procedures at the airport for those performing Umrah outside the Hajj season are slightly different, resulting in a significantly shorter stay at the airport than those performing Hajj. 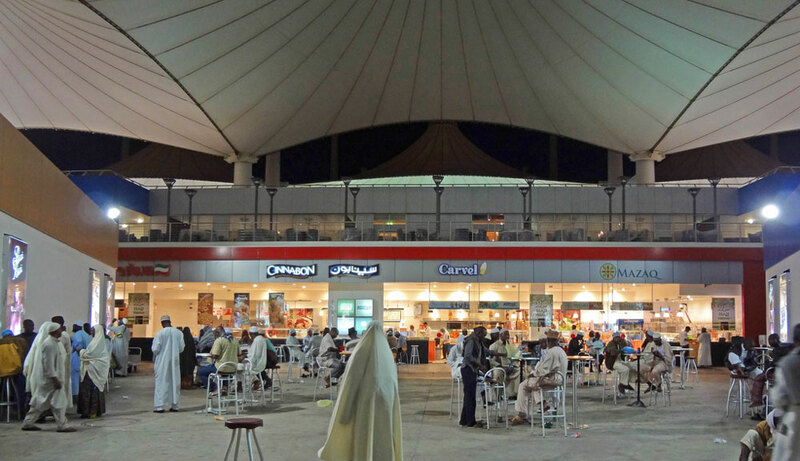 Terminal – Even though the Hajj Terminal should also be used to process Umrah pilgrims, there may be instances where you are processed in one of the other terminals. If you’re unsure about which terminal to report to for your arrival and departure, ask your travel agent or get in touch with the airline you’re travelling with. Drafts / Cheques – Drafts aren’t required for those performing Umrah hence you won’t be designated a Mutawwif office, nor will your transportation be provided for in the form of travel coupons. Therefore, you can disregard the sections about Mutawwifs and travel coupons if you’re performing Umrah. Travel – Since you won’t be provided with travel coupons, you will have to arrange your own transport to Makkah and Madinah. Taxis and other forms of transport can be hired outside the terminal. Please refer to this article for more information about travel within Saudi Arabia. Passport – If you’re performing Hajj, your passport will be taken away from you, stored at the Mutawwif office for the duration of Hajj and returned to you on departure. This isn’t the case with Umrah. Once you have cleared immigration and customs, you will come across a “Tehsiliya” official whose role it is to register you electronically and see that you’re transported to Makkah. An official will guide you to your transport if it has already been booked by your travel agent, hand over your passport to the driver who will then return it back to you once you have reached your hotel. If you’re going to hire a taxi or another form of transport outside the terminal on your own accord, make sure you get your passport back from the official. It is illegal for anyone to withhold your passport if you’re not performing Hajj.